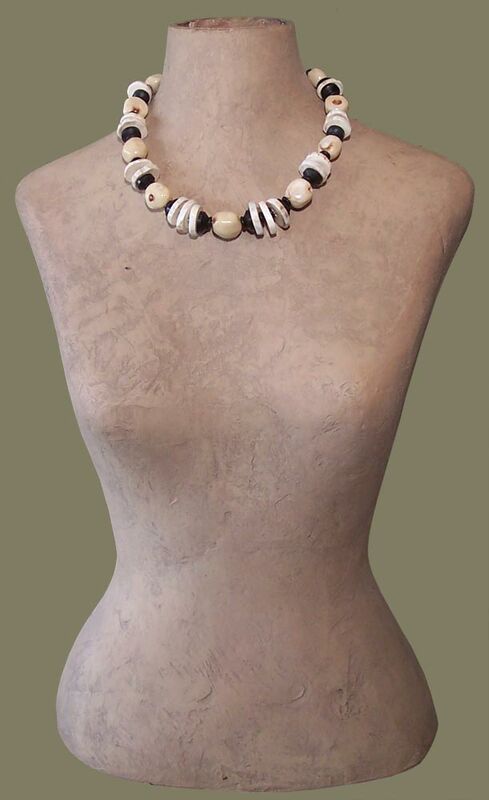 “White Coral Necklace”: A Play Off the Theme of Black and White, This Chunky Artisanawear Necklace Sports Organic Round, Creamy-White Coral Beads, and Hand-Cut and Polished Beads Made From Slices of the Axis Deer Antler. Just Outside the Artisanaworks Studio/Workroom, Located in the Texas Hill Country, These Axis Deer, With Their Hunched Backs Covered with White Spots, Roam in Abundance. Originally Brought to Texas From India, This Species of Deer Produce Antlers That Can Grow to Enormous Heights…Basically an Ivory-White in Color With Subtle Splashes of a Taupe Grey, and Beautiful When Polished. Industrial Washers and Small Wood Disc Beads in Black Act As Spacers, Adding Contrast. Gold-Tone Chain and Barrel Clasp. Artsy, One-of-a-Kind Jewelry Necklaces Designed and Handmade by Carol Tate. Please See Fashion Accessories Jewelry~Bracelets for Co-ordinate.